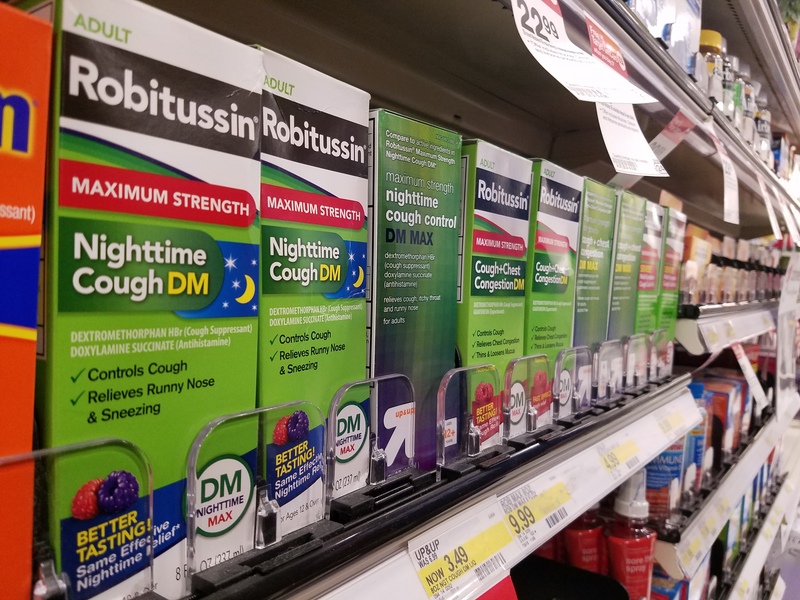 Dextromethorphan, a chemical commonly found in cough and cold medications, has been making its rounds as a party drug among teens and college students due to its accessibility and hallucinogenic properties, according to various websites. Usually called DXM, Triple C’s, or Robo, dextromethorphan is a derivative of morphine that when taken in high doses can cause hallucinations, dissociation, and loss of simple motor skills. The medication’s extreme effects have been compared to those of the illegal drugs PCP (Phencyclidine) and Ecstasy, but it is the active ingredient in Mucinex DM, Robitussin and Nyquil which is found openly on the shelves at most stores including convenience stores and the Seminole State Sanford/Lake Mary campus bookstore. Workers in the bookstore expect customers to be responsible adults and use the provided medications by the recommended dosage labeled on the back of the package. Florida is one of the few states with laws in place that require buyers to show an ID when purchasing anything containing the drug. Most states don’t require an ID, making it easier for underage individuals to purchase it, though in many cases users claim to just steal it. Some people also prefer ordering it online on every day sale sites such as Amazon, which is a lot harder to restrict. Different doses of the drug result in what is referred to as various “plateaus,” meaning that the more an individual takes the more their experience will vary. Sites such as Erowid.org have detailed the different plateaus and dosages recommended to reach them, enabling newer users to knowledgeably dose themselves. Many people claim this site enables underage people to partake in the recreational use of the drug, despite the site not being an easy find unless one intentionally seeks it out, but this judgment is left to the individual. Dextromethorphan’s psychological effects normally include dissociation; a feeling of disconnect from one’s self, paranoia, immense feelings of joy or love, hallucinations, and mental slowness. Motor skills can also be inhibited, making it difficult to walk, talk and properly control their extremities. Overheating, sweating, extensive urination, nausea and blotchy red skin are also known effects of overdosing on the medication. Many users report an intense feelings of exhaustion and zoning out during the “come down” period when the effects begin to stop. In 2004, the Drug Abuse Warning Network reported that just under 1 percent of drug-related emergency room visits were due to DXM related medications. With each use, the user is required to up the dose if the chemical hasn’t been given time to completely make its way out of their system, the search for the same high as the first is what causes a lot of users to dose themselves up to a 1000 milligrams at once, increasing the risk of long-term effects such as liver failure, insomnia, extended amounts of dissociation, withdraw fatigue and even overdose. The recreational use risk of this drug, while still debated among users on online chatrooms and forums, varies depending on the user and the dosage. The availability and affordability may make it seem like the perfect drug investment to some, but individuals must take their own physicality into account and decide what is best for themselves when faced with a decision regarding any kind of drug. It’s important for individuals to stay informed about what they’re getting themselves into and to take any and all precautions they can to keep themselves healthy and alive. If you feel like you need help or someone to talk to, contact a campus counselor at 407-708-2337 during campus hours or 407-416-9976 Monday to Thursday after 6 p.m. and 24 hours on the weekends.